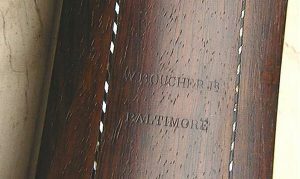 W. Boucher Jr. stamp. Click on images to expand them. Following up on my recent blog post about genealogical memory (“What do you know?”), I took a fresh look at some persistent brick walls in my mother’s family. 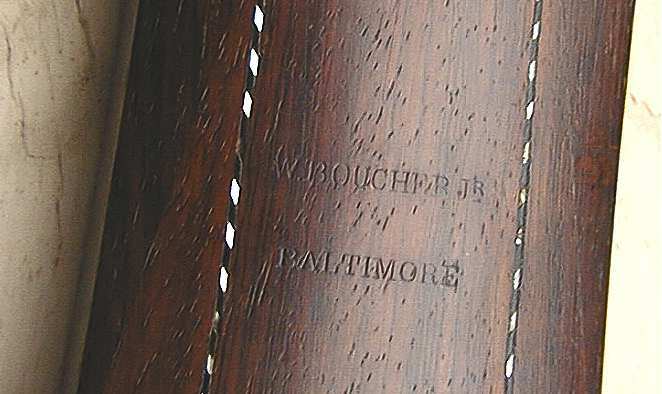 The blog post – and a 5-generation fan chart template I got from two colleagues – led me to reflect on whether anything more could be gleaned about the background of my great-great-grandfather, William Boucher Jr. (1822–1899) of Baltimore, Maryland. The answer, I’m happy to say, is “Yes”! I’ve written elsewhere about William Boucher’s 1845 passport, which, “Brigadoon”-like, keeps vanishing on me. 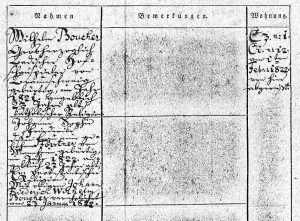 My notes on the passport, though, indicate that Boucher was born in Bielefeld, near Mannheim in Baden, on 12 September 1822. It was on that basis that my father and I made a side trip to Mannheim in the summer of 1981, where a kind city archivist helped me create a rough ancestor table with dates (now also misplaced) for William’s parents and grandparents. 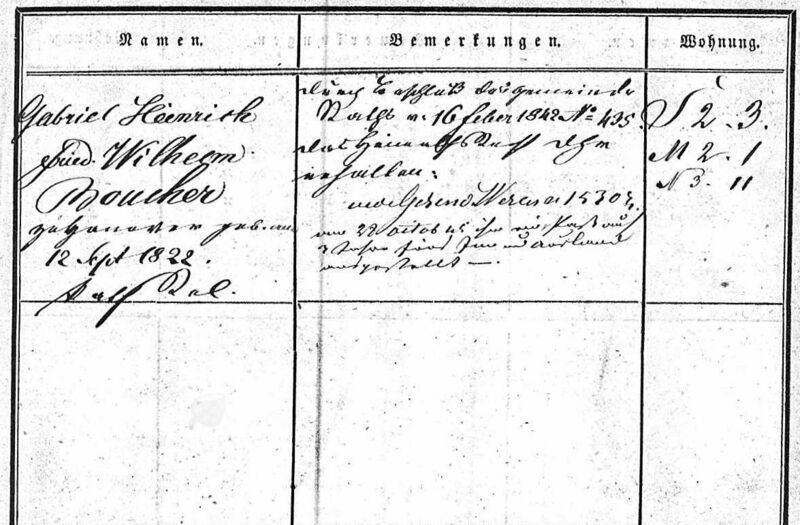 My first breakthrough, in reverse chronological order, was the appearance in an Ancestry.com database (Mannheim, Germany, Family Registers, 1760–1900) of a Gabriel Heinrich Friedrich Wilhelm Boucher, born in Hannover on 12 September 1822. These names are interesting, as is the order, as they reflect the forenames of my William Boucher Jr.’s paternal grandfather (Gabriel Boucher of the City of Brunswick in Lower Saxony), maternal grandfather (Johann Heinrich Förstner of Mannheim), and father (Johann Friedrich Wilhelm Esprit Boucher, living in Mannheim in 1821). 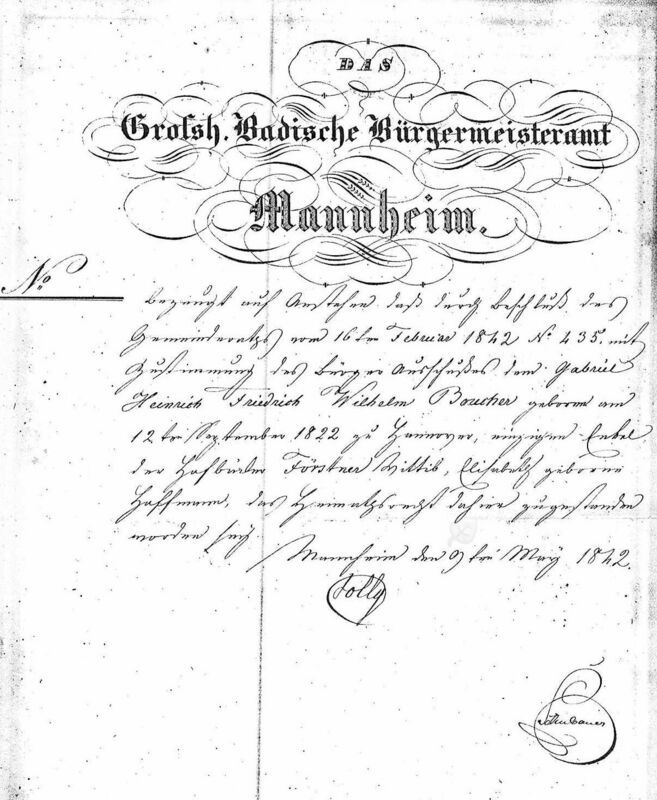 The document on which Gabriel Henrich Friedrich Wilhelm Boucher’s names and birth date and place appear places him in Mannheim on 9 May 1842. While the names and dates are legible enough, the purport of the document is a bit unclear, although it also mentions the surname and maiden name of my William Boucher Jr.’s grandmother, Johanna Elisabeth Förstner geb. [born] Hoffmann – perhaps it is some sort of a guardianship document, as my notes indicate Frau Förstner died in 1850. I had discounted the place, since my notes – imperfect, I now see! 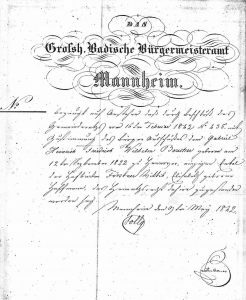 – indicated that he was born in Bielefeld/Mannheim, rather than (as is true) being the son of parents married there and himself a resident there as late as 1845. While I can find no information on his birth and baptism in Hannover at Ancestry.com or FamilySearch.org, the Mannheim, Germany, Family Registers, 1760–1900 database lists Gabriel Heinrich [Friedrich] Wilhelm Boucher twice, both times born 12 September 1822, and the 1842 reference includes the information that he was born in Hannover. So I feel reasonably confident that this Gabriel, born in 1822 and shown in relation to Frau Förstner geb. Hoffmann, is my great-great-grandfather, known in America as William Boucher Jr. Both Ancestry.com and FamilySearch.org have more to offer on Gabriel/William’s parents, Wilhelm Boucher (bp. 1799) and Johanna Sophie Friederike Förstner (b. and bp. 1795). 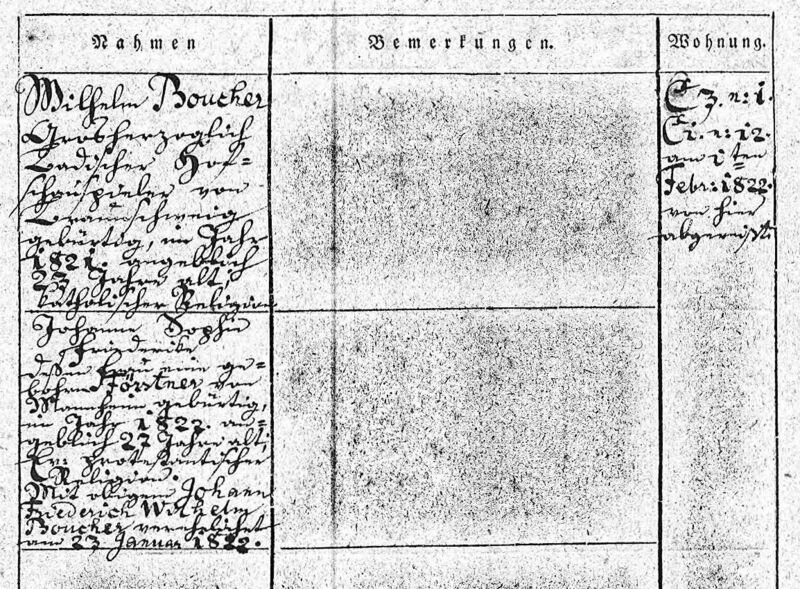 The Deutschland Geburten und Taufen, 1558–1898 database at FamilySearch.org lists the baptisms of six sons of Gabrielis Boucher and Mariae Spiritus Messager at Braunschweig [Brunswick]: Isidorus Gabriel Boucher, 1 March 1796; Thomas Augustinus Josephus Victor Boucher, 3 September 1797; Joannes Fridericus Wilhelmus Spiritus Boucher, 15 March 1799; Henricus Josephus Boucher, 1 September 1801; and twins Carolus Petrus Franciscus Boucher and Josephus Ludovicus Gabriel Boucher, born 24 and baptized 27 January 1811. There are two other intriguing Boucher baptisms in the period, for Gabriel August Theodor Julius Boucher (bp. 1819) and Spiritus Georg August Isidor Boucher (bp. 1822), sons of Hermann Karl Friedrich Boucher and Johanna Elisabeth Friederike Schmidt: perhaps Hermann Karl Friedrich was an older son of Gabriel and Marie, born before they arrived in Brunswick. Johanna Sophie Friederike Förstner, born 4, baptized 5 November 1795. Johanna Friederike Magdalena Förstner, born 12, baptized 13 November 1797. Johanna Jacobina Susanna Förstner, born 10, baptized 11 October 1798. Friederike Henriette Förstner, born 25, baptized 26 February 1800. Johann Friedrich Förstner, born and baptized 24 May 1802; he probably died in infancy. Johann Friedrich Förstner, born 18, baptized 19 September 1803; died 23, buried at Mannheim 25 July 1804. Johann Wilhelm Förstner, born 14, baptized 16 January 1805; died 29, buried at Mannheim 30 September 1809. Marie Philippine Förstner, born 26, baptized 28 November 1808; died 12, buried at Mannheim 15 December 1827. Wilhelmine Rosine Förstner, born 13, baptized 16 June 1811; died 30 June, buried at Mannheim 2 July 1812. 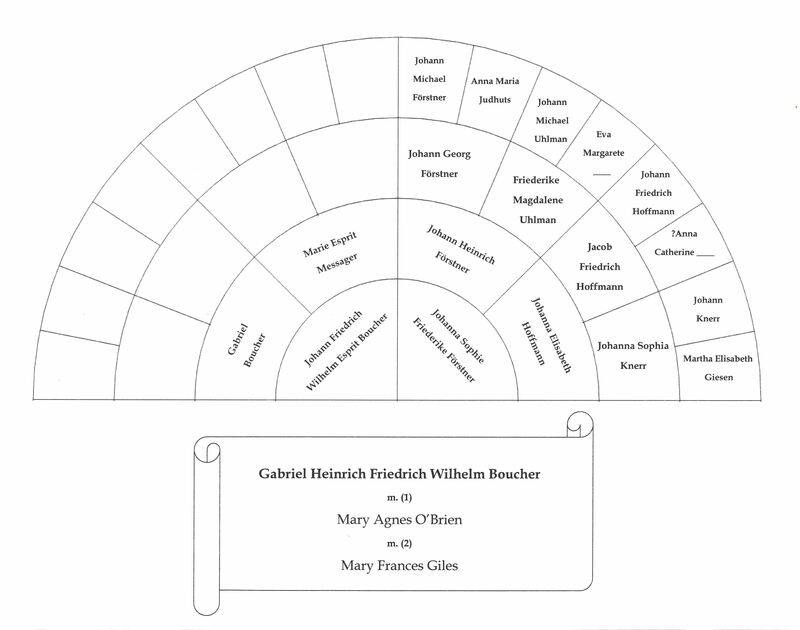 And because this was a prompt for a fresh look at the Boucher and Förstner question, here is a chart showing three more generations of Sophie Boucher geb. Förstner’s forebears. 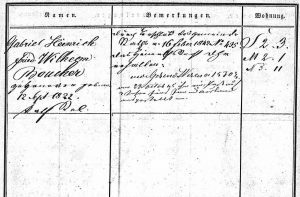 Mannheim, Germany, Family Registers, 1760–1900. Boucher, “Memorandum Book,” [p. 6]. Deutschland Geburten und Taufen, 1558–1898, at FamilySearch.org. Ancestry.com calls the same data set Germany, Select Births and Baptisms, 1558–1898. William Boucher Jr.’s children included Elizabeth Sophia Boucher (1849–1876), Frederick Vincent Boucher (1850–1856), Francis Xavier Boucher (1853–1927), Victor Emile Boucher (1860–1878), Maria Josephine Boucher (1862–1863), William Maria Boucher (1867–1921), Mary Josephine Boucher (1868–1961), Frances Marie Boucher (1872–1954), Ernest Gabriel Boucher (1876), and Emile Gabriel Boucher (1886–1950) – a daunting list of names associated with the Boucher family of Brunswick (and, to a lesser extent, the Förstners of Mannheim). Another child of William Boucher Jr. and his second wife was Carlos Herman Boucher (1877–1968), who might have been named for Hermann Karl Friedrich Boucher of Brunswick. Information on the first five children reflects searches in both Deutschland Geburten und Taufen, 1558–1898, and Germany, Select Births and Baptisms, 1558–1898. This information, for the last four children, comes from the Baden, Germany, Lutheran Baptisms, Marriages, and Burials, 1502–1985 database at Ancestry.com. Thank you, Scott, for sharing your wonderful research on the Boucher family. Just deciphering the 19th century German script must have been a challenge. Thanks, Robert! A challenge, certainly, but it helps to be directed to baptismal or marriage records, so one knows what one is looking at! I’d say ineptly rather than reluctantly pursued – and thanks for taking me to Mannheim all those years ago! Fabulous story! Did you find the German records via searching the indexed records … or browsing (since you already knew the dates and places)? Is the Memorandum Book available on Ancestry.com or FamilySearch.org? If not, how/where did your cousin find it? No, the Memorandum Book is a book in my cousin’s possession — passed down from her parents. And thanks! This was all as the result of searches, although I knew the general outline for my great-great-grandfather and his parents. Very interesting bit of research, and a good reminder to us not to attribute modern usage to our ancestors’ lives. I see that the list of children shows lots of children named Johanna and Johann. Several of the Johanns died, but you don’t show death dates for the Johannas. I have worked on a family in which EVERY boy was Johann and EVERY girl was Maria, and they didn’t die. The only way you tell them apart is by their second names, so Johann Friedrich was Friedrich. The only boy called Johann was Johann Johannes. I learned that just because a later born child had the same first name, that child didn’t necessarily die before the other child was born. The 4 first names drives me crazy! Especially when they use a different call name at different times. And all the women are named Minnie? I guess it’s only fair if all the men are Wilhelm. Or John! I nearly missed my ggrandfather the year he was Carl with a wife and children matching John in the same location where John lived the 10 years before and after. Michael, the papers associated with my great-great-grandfather mention Bielefeld as well as Mannheim, and it was my understanding on a visit to Mannheim that Bielefeld was a smaller town/village in the neighborhood — one then swallowed up as Mannheim expanded. The papers I’ve quoted here don’t mention Bielefeld at all, it would seem — and this whole discussion speaks to doing research in a language one understands imperfectly! On the other hand, if Bielefeld in Westphalia has a population of Bouchers, that seems like an excellent place to look for connections to the Bouchers and the Forstners (who were of Mannheim).